When a new church vestment project is first taking fo starts with a sense of “designers block.” (Designer’s block is a close cousin to writer’s block). You know that feeling fear. It often begins with a blank piece of paper, an empty canvas for an artist, or a plain piece of unadorned fabric for a designer. No shape, no form, nothing. But how can one get beyond that void of emptiness and get on with the work of designing and creating a project? I think back to those long ago days in design school. Our instructor told us to ALWAYS keep a notebook and pencil close at hand. We were to pull it out often and fill it with all kinds of ideas. We were to look at the world around us – nature, sky, things in a shop or a museum. Nothing was to go unnoticed. Of course, foolish students that we were – did we listen? Of course not. Or at least, not often. But there is much wisdom in what she tried so desperately to drill into our minds. By continually training the mind to look, observe, and note the things we come in contact with on a daily basis, suddenly, the mind has a wealth of thoughts and ideas to pull from. And so, over the years, I have learned to modified her advice for use in a variety of ways. Now I admit that my days are not filled with exciting sites. This time of year, it is dark in the morning when I go to work and dark in the evening when I come home. I sit at a desk all day, and there is not much to observe. But, when I get home, I have a rich abundance of resources available at my finger tips to serve as an inspiration for projects. Sometimes, admittedly, I have too many resources, and that can have its own set of problems. 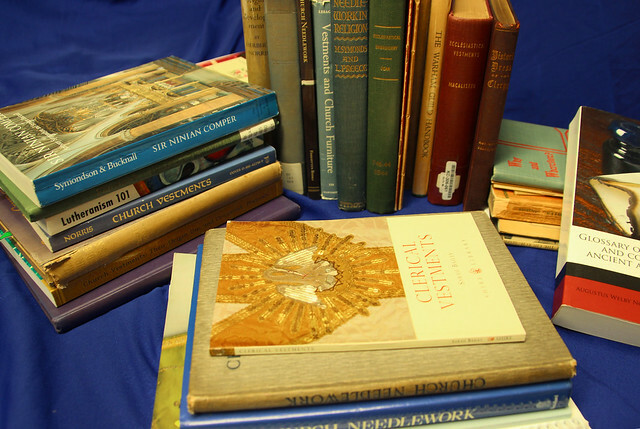 So each new church vestment set begins with some sort of research for an idea from which a beginning might be made. As project begins, it seems to take root, and will often flourish as more ideas come to mind, and more possibilities are explored. And so begins this stole project. There are at least 5 or 6 stoles to be made within about 3 to 4 weeks. There is no time for sending back and forth for machine embroidery. The budget is rather limited, and so, I must make do with variations of simple designs suitable for applique and machine embroidery, and with the use of orphrey trims. 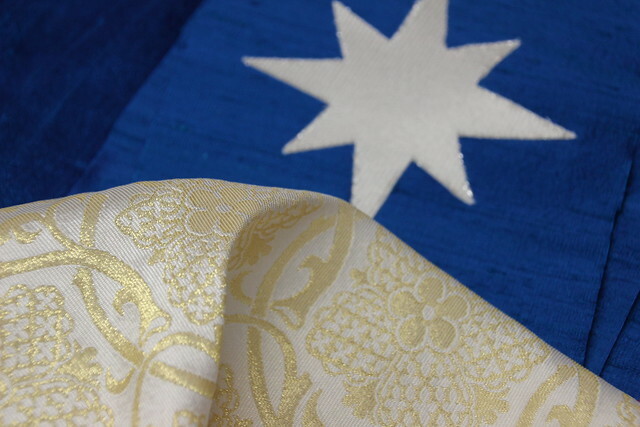 The first stole in need of construction will be a blue stole for Advent which is only a few short weeks away. So what might be appropriate designs for use on an Advent stole? This morning on the way to the office, it was unusually dark. The sky was beautifully illumined by the crescent moon and 3 or 4 vibrant stars in the eastern sky. And there begins the idea. It was a star that led the wise men from the East to the New Born King – the Christ Child. And so, a star will be used on the Advent stole as a reminder so that we too may seek out the King of Kings. Stars in the night sky twinkle and sparkle in such a way as to capture our attention. So, too, will the stars on the Advent stoles. 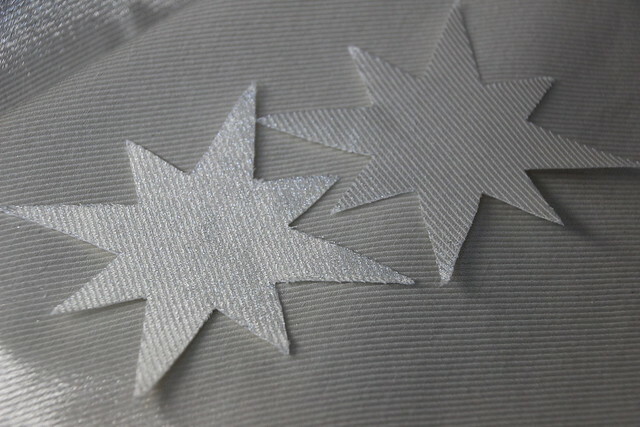 Using cloth of silver, this star shape will be cut and appliqued to the stole, and outlined with a soft metallic gold thread. Why gold thread? The Cloth of Silver shimmers with a faint glow. But the silver is so soft, it is almost white. Knowing the use of some fabric as an orphrey would be helpful in minimizing machine embroidery and applique, the search was on. Many fabrics are not quite suitable for use as an orphrey. The design may be too bold, or the wrong style. 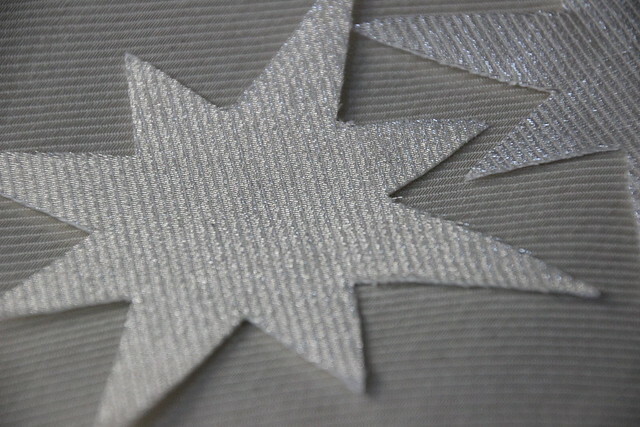 Knowing none of the fabrics in the collection have a silver cast, the next option was white. And so a next decision is made and there we will end another day in the Ecclesiastical workroom.